Crochet, a word that has been linked by many of us with grannies. After all it was mostly our grandmothers that made all those lovely sweaters to keep us warn during winter or that beautiful ivory curtains hanging in their kitchen window. While crocheting is considered old-fashioned if you have a look online you will be able to find an enormous variety of items you can crochet that are far from it. Recently, however, I have learned of a different, unique and cute project that makes crocheting truly special. 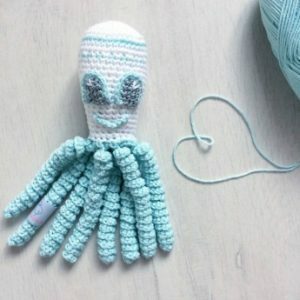 A crocheted octopus toy (yes, you can actually crochet an octopus!) can help premature babies feel safe while in the NICU. Although it may seem a lit bit odd for premature babies to have such a companion by their bedside, crocheted octopuses have been linked to better health and well-being for the tiny fellows at neonatal units. The idea began at Aarhus University Hospital in Denmark, where medical staff reported that a toy octopus calmed babies as the tentacles resemble the umbilical cord and remind the babies of their time in the womb. The crocheted eight-legged creatures create a sense of safety for the fragile babies as they grow in their sterile incubators. Preterm babies often struggle with breathing and keeping a steady heart rate. To those that were given the octopuses improved breathing and cardiac patterns were observed and, as a result, increased levels of oxygen in their blood. They also found that babies cuddling an octopus were less likely to try to pull out their monitors and tubes. 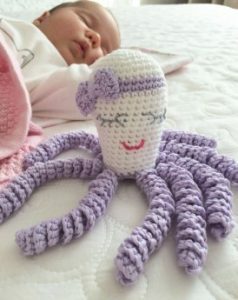 A group of crochet volunteers in 2013 started the “The Danish Octo Project” and have donated octopuses in 16 of the neonatal departments in the country. Since then, the project took off in other countries too including Norway, Iceland, The Faeroe Islands, Germany, Belgium, The Netherlands, Luxembourg, France, Italy, Turkey, Croatia, Israel, the Palestinian Territories, Australia and in both California and Florida in the United States. In the project’s website there is a written pattern available in English as no any crocheted octopus will do. The toys need to be specific in size to fit the incubators and made of 100% cotton yarn. My grandmother and my mother taught me how to crochet when I was little and I couldn’t be happier today as I can take part in this great cause! If you wish to make a difference to the lives of these fighter babies and their families start crocheting today; it is not hard at all and you have the best motive for it! Find a list of participating here.